I recently received a request from a reader to come up with some example Boolean Strings for finding software engineers on Facebook who are from Top 10 schools (Stanford, Berkeley, MIT, CMU, etc) and live in the Silicon Valley. I am definitely not a Facebook sourcing guru – I don’t see it as a high yield source for proactive and highly precise sourcing as it is a relatively “shallow” source of information, it’s search interfaces are quite limited, and when x-raying into Facebook you can’t see much information. I’d invite anyone reading this that has suggestions and best practices to please add them. Okay, now that I got that out of the way, searching inside Facebook for people that you don’t “know” (they aren’t your “friends” yet) has become more and more restricted over time. 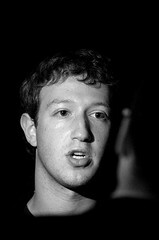 There are a few ways to search for people within Facebook – I will cover 3. 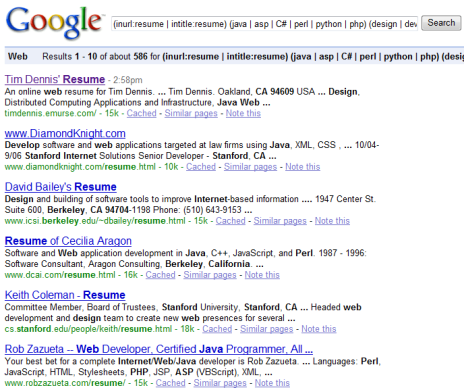 As you can see from the screenshot, on this page you can search by school OR employer. Not a real help for what you’re trying to accomplish – finding web developers from specific schools. Although you can search by school here, it doesn’t allow us to drill down into interests, combine a school with an employer, or even pick a location. And you can sift through the results to check location and see that many of the results are in fact in the Silicon Valley, and also view each person’s friends to try and find more people. You could do this systematically covering all of the top schools you’d like to target and all of the top employers in the Silicon Valley you’d like to see people from. This can be a good start to reaching out to some of these people and becoming their “friend,” or taking the information you find here and performing some more research, cross-referencing LinkedIn, blogs, and other sites to find out more about them. However – with this search inside Facebook, we still don’t have any control over what these people actually do. Here you can find Facebook’s “advanced” search interface – where you can search within your network and Friends or your location. 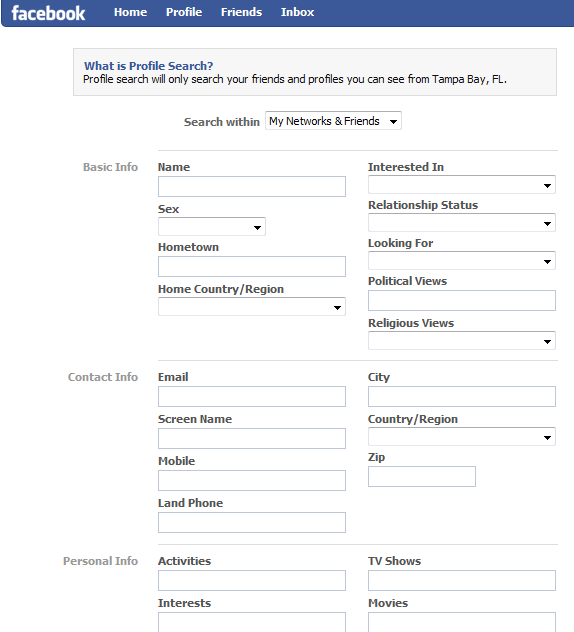 So if you live in the Silicon Valley, you should be able to search profiles in your desired area. Although this is supposedly an “advanced” search interface – you can see it is actually quite limited. On this page you cannot search by school. However, you can search by academic concentration (you could shoot for Computer Science and such), activities and interests (web development and design…), as well as company and position (target company and software engineer, etc.). However, because you cannot search by specific school – this interface does not enable you to achieve your goal of targeting people by skill/experience as well as college/university. But for other searches – this interface can yield results for you. 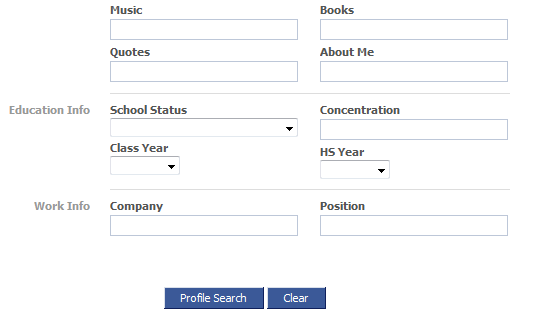 We can use the site: command on most major search engines to look specifically within Facebook and try to find people. Sometimes people don’t enter all of their information – like school, experience, titles, skills, specific location, etc. If it’s not there – you can’t find it. When using a search engine to search into a site like Facebook, you’re not searching structured data. So searching for Stanford might yield a result where the word “Stanford” is mentioned on the profile somewhere, but it isn’t where the person when to school. That’s what I call a false positive. I was not provided any specific programming languages or frameworks to target in my searches, so I just chose a few as an example – they can be switched up as you see fit. I also started with 2 of the schools that were mentioned – feel free to build out the list. You’ll notice that when you run that search and check the results – you won’t find a large number. I found 2. The issue goes back to the point I made about if a person doesn’t explicitly mention a specific search term you’re looking for – you simply can’t find them by using that search term. 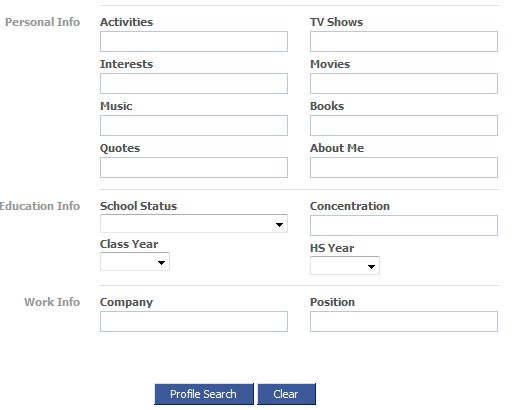 Facebook isn’t a resume database – most people don’t fully flesh out their profiles with tons of technical detail with regard to their skills and experience. 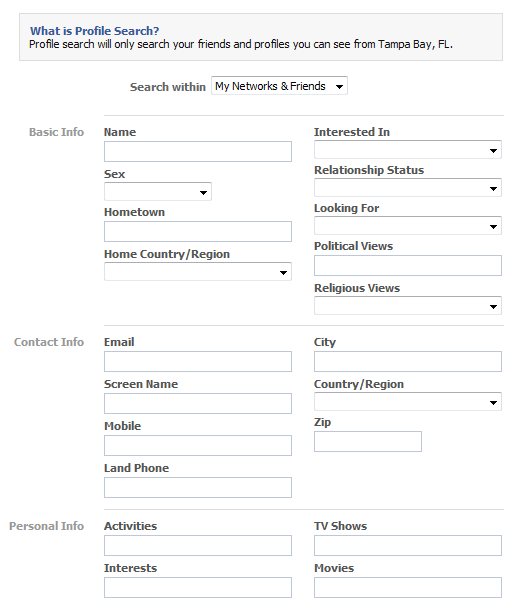 When it comes to reviewing the results – you won’t see the programming languages or even the college names (sometimes) because you aren’t connected to, or in Facebook-speak aren’t “friends” with the people – so you can’t see their profile page where the search terms are. However, they are in there somewhere. You can try to add people like this as a friend and then contact them, or simply try sending them a message, or view his friends – and from checking them, several went to Stanford. But without digging more into each of them, we can’t tell from the surface what they do (web developers or lawyers…), or where they live. If you click on Kai you can see he is a Stanford ’05 alum. 569 results – and I only tried 2 schools. I used a San Jose, CA zip code in LinkedIn – it considers the San Jose area part of the “San Francisco Bay Area” – a 50 mile radius. Searching into LinkedIn using the site: command is fraught with the same issues as we encountered when searching Facebook – it’s unstructured data. So do expect some false positives – it won’t be 100% perfect. 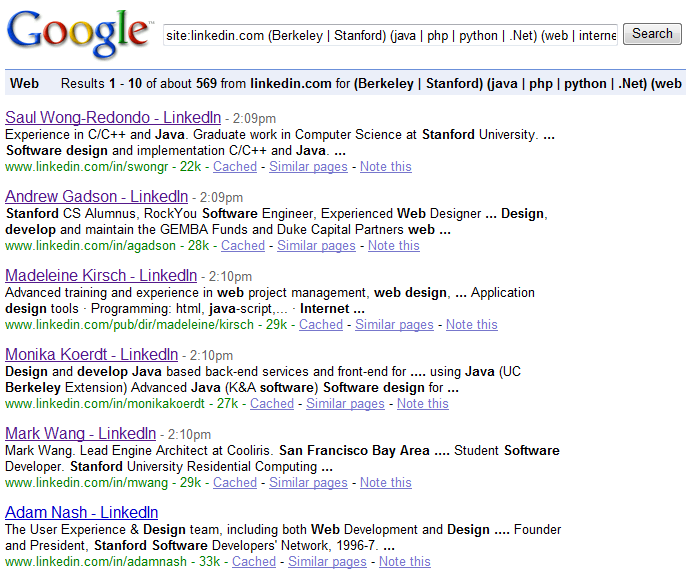 I checked through the results and many are local developers who have gone to Stanford or Berkeley. 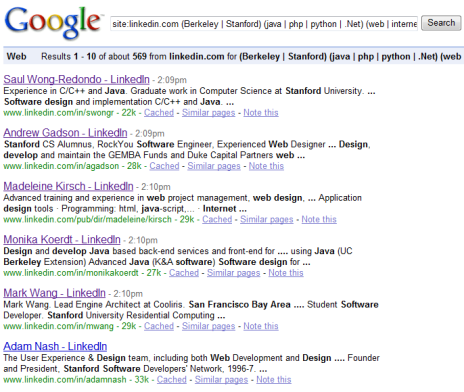 Of course, you could also search inside of LinkedIn – but that’s another post. That’s a 25 mile radius search from 95125 and yields 586 results. Sweet. 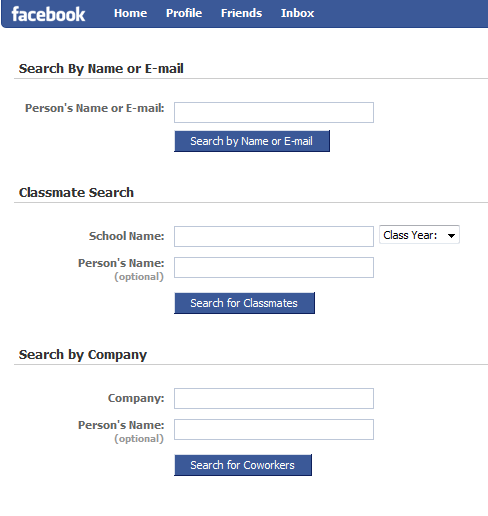 So can anyone see why I’m not crazy about using Boolean strings to search Facebook? Can you find great people in Facebook? Sure! Can you run precise queries to quickly find large volumes of highly matched people with specific skills and experience? No. Would an oil company avoid drilling the largest oil fields they have access to and instead spend tons of time and money looking for and drilling the smallest oil deposits they could find? It only makes logical sense for sourcers and recruiters to leverage high yield sources first and low yield sources last.